Memorials provide are a good resource for family history research and we will try to provide some of that information here. Memorials in and around the Millthorpe areas will be added over the coming months and names transcribed where possible. Millthorpe War Memorials are located at Remond Oval on Park Street, adjacent to the Museum. If you can not come to see the memorials a list of men and women listed on these memorials is available at the Museum through our Family History request. 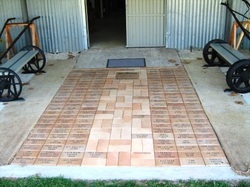 The Millthorpe Pioneer Wall is located in the Golden Memories Millthorpe Museum grounds. 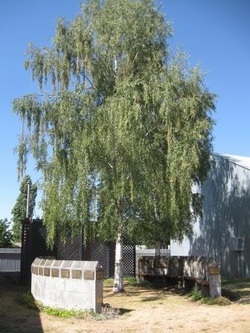 It was erected to mark the 25th anniversary of the Museum on 17th November 1990 and has brass plaques for pioneers which were contributed by families. Further plaques were added and unveiled for the 30th anniversary on 18th November 1995. If you can not come to see the Pioneer Wall a list of pioneers is available at the Museum through our Family History request. The Mill Walk is located outside the Museum of Rural Technology at the Golden Memories Millthorpe Museum. It has engraved pavers with employee names and positions from the Great Western Flour Mill in Millthorpe. If you can not come to see the Mill Walk an employee list is available at the Museum through our Family History request.